Mizuno Wave Ultima 10 are neutral cushioned running shoes. Finally the Mizuno Wave Ultima 10 "comes out of the closet" and officially requests attention with Amsterdam Marathon special edition plenty of orange to celebrate the event. Located somewhere between popular Wave Rider 22 and premium Wave Sky 2 within cushioned running shoes lineup from japanese brand, the Wave Ultima 10 features abundant cushioning and reliable construction at reasonable price, its best argument to back good sale figures. 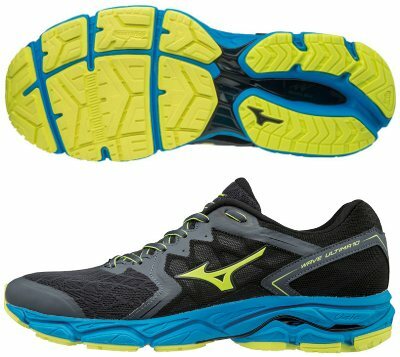 Most interesting (almost the only one) change from its predecessor Wave Ultima 9 is the revamped upper which follows latest trend from Mizuno of specific layer to embrace midfoot (see its counterpart with pronation support Wave Inspire 14) for snug and secure fit. As side effect, classical Runbird logo is significantly smaller and even toe cap reinforcement is fused instead of stitched. Another highly appreciated feature is the gusseted tongue to prevent not only pebbles from jumping inside but also annoying folds for improved comfort. Rest of Wave Ultima 10 remains the same 12 mm drop midsole construction where CloudWave™ plate isolates reliable U4ic™ platform on top from U4icX™ wedge for great and firm cushioning. Outsole does not change either and keeps main flex grooves in forefoot to promote smooth transition and robust X10 rubber in more exposed areas to increase durability.